Don’t let this “toy” tank fool you, it can pull its weight even in higher BR battles using its high mobility to spot and outflank. Historically it also showed its mettle against superior armored but slower forces were used successfully in blitzkrieg tactics again and again. Mobile armor (“tanks”) were a war technology the Germans were seriously deficient in. During the First World War they only had limited number and experience with a single design (A7V) and post war the Versaille treaty forbade any development let alone production. While secret designs and experiments were conducted during the 1920’s they still had nothing that could be considered a tank. It was Lieutenant Colonel Heinz Guderian who spurred the urgency for armor, outlined performance requirements, and pushed for production. With Hitler’s rise to power, armor was given a priority, except few knew how to make or use them. It was decided to build a simple and cheap stop-gap “Sonderkraftfahrzeug (SdKfz) 101” (special purpose vehicle 101), better known as the “PzKpfw (Panzer) I”, as a training tool for design, testing, and training. As experience in making and using the Panzer I grew so did requirements for their main battle armor design; however progress was very slow so it was decided in 1934 to build yet another stop-gap, the SdKfz 121, better known as the “PzKpfw II”. Ostensibly a larger PzKpfw I, it incorporated a significant number of improvements and added a 20mm cannon over the pair of obsolete MG-13 machineguns. The resulting vehicle was about on par with light armor from others nations, a notable accomplishment for a nation new to modern armor design, except it would be no match against nearly any armor and anti-tank weapons fielded by other countries. Despite this, when the war started on September 1st 1939 it made up a significant proportion of Wehrmacht forces during the Polish invasion. Eight months later in the Blitzkrieg of the west it was still the most numerous armor unit and Germans used the up-armored “Ausf C” version to great effect against vastly superior forces! It was not finished yet. Over a year later it was again a major unit in the blitzkrieg of the Soviet Union helping in early gains where its speed and terrain handling in recon duties compensated for its weak armor and weapons; however once the front became stagnant the PzKpfw II was completely doomed. Still, its legacy as a “training tank” that was pivotal to victory in several major battles is amazing. It was the little tank that could! 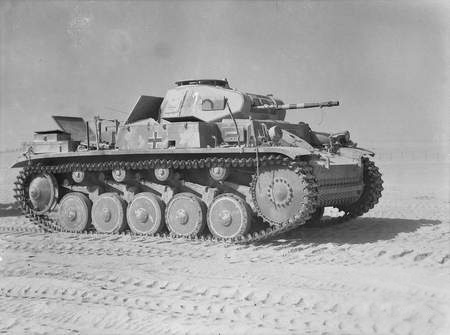 A captured Panzer II near El Alamein, Egypt, in August 1942. Although lightly armored with a weak 20mm cannon, do not underestimate the capabilities of this “toy” tank. With good top speed, maneuverability, terrain handling, and a low profile it makes for an excellent scout and out flanking enemy forces. Acceleration is a respectable 3.9 seconds to 20 km/h, 6.8s to 30, 10.8s to 40 with top speed about 42 km/h on average terrain. Don’t rush to hot zones where you will quickly be destroyed. Instead use terrain to hide your moves, call in artillery, and hit exposed flanks and rear were point blank the 20mm is very effective at doing critical hits (learn weak points). The beauty of the 20mm is a magazine of 10 rounds that increase the chance of a penetrative round doing critical with burst fire at different areas on target. The 20mm KwK 30 L/55 default load is a 50/50 mix of API-T/HEFI-T (PzGr/Sprgr), with respectable 35mm penetration at 100m and the HE round will take out soft skinned targets like artillery and SPAA fast. Unlockable loads include a pure PzGr and Sprgr and finally the highly desirable PzGr 40 with 45mm at 100m. Team battles is where it shines; it can scout out the enemy, harass with pop up cannon barrages and artillery to distract, help teammates that get stuck, squeeze through all city passages, and best of all has extra respawns with the Reserve unit capability. And if the pure load of Sprgr HEFI-T was a clue, yes, it is also an excellent armored SPAA to boot! Drive up inclines to increase elevation and profit! Facing off against a Pz 2 is more a matter of being alert than a big gun. Except for the front up-armored section it is thin skinned and an easy kill, but it can come in fast and unload a barrage of 20mm into your vulnerable flank before you realize it’s there. They could also distract you from a more formidable threat coming down the road. 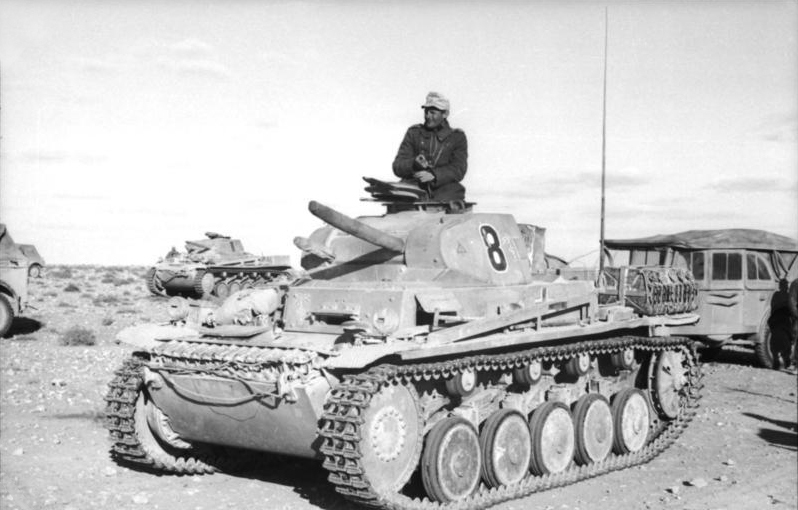 The Reserve Ausf C and Premium DAK (Deutsche Afrikakorps (German Africa Corps)) are identical with 1.0 BR while the Ausf F (BR 1.3) incorporates better side armor at the expense of frontal armor and a faster firing main gun from 279.6 to 450 SPM, and note non-Reserve only spawn once. The faster rate is a mixed blessing as one can easily expend the entire magazine uselessly, 3 round bursts are better even point blank as you find that vulnerable point. After unlocking the PzGr API-T round unlock Repairs and Fire Extinguisher as you will use them, often. Panzer II, the toy terror tank!